The world of jewelry uses the renowned 4 C’s (color, cut, clarity, and carat) to classify gemstones. Diamonds are almost always classified using this system because of their basic chemical composition and recognizable crystal structure, which allows for a consistent systematic analysis. 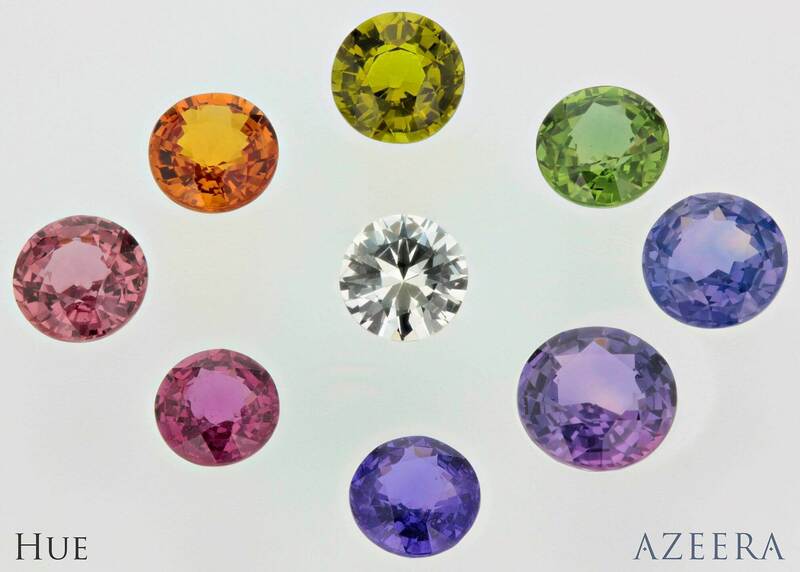 Color gems on the other hand differ from diamonds and are not easy to classify with the 4 C’s. 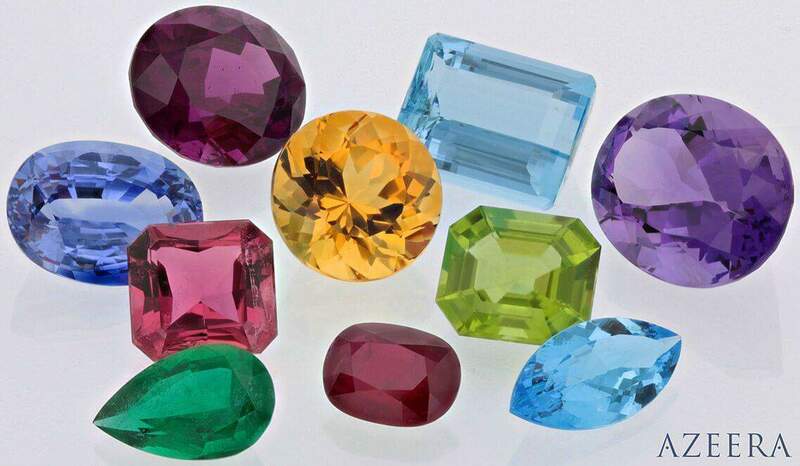 Color gems have a diverse chemical make-up and their crystal structure is often unique to the gem’s originating source. For example, Kashmir and Australian sapphires are inherently different. Kashmir sapphires tend to have a rich, velvety blue color, while Australian sapphires tend to be darker with a gray/green secondary body color. These color variation are attributed to the different varying concentrations of iron within the gem. Kashmire sapphires contain very little iron while Australian sapphires have high concentrations. Grades are also based on color, cut, clarity, and carat, but they are not nearly as systematic. We feel it is disingenuous and insufficient to label our stones according to this grading system because grading is highly subjective to the individual assessing the stone. Gemstone grading does not provide a factual analysis, but rather an interpretation for marketing purposes, and it can sometimes be misleading to the consumer. 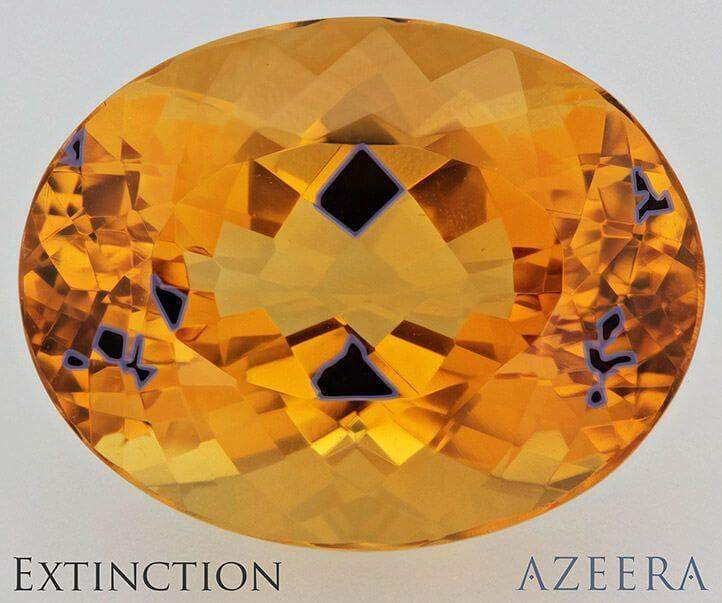 Our focus at AZEERA is simply to capture all the quality features you’re looking for in a gemstone by providing top-level gems with distinct colors, clean polishes, and precision cuts in line with AAA grade. For more information on our philosophy on colored stone grading, please see the Colored Stone Grading Article. 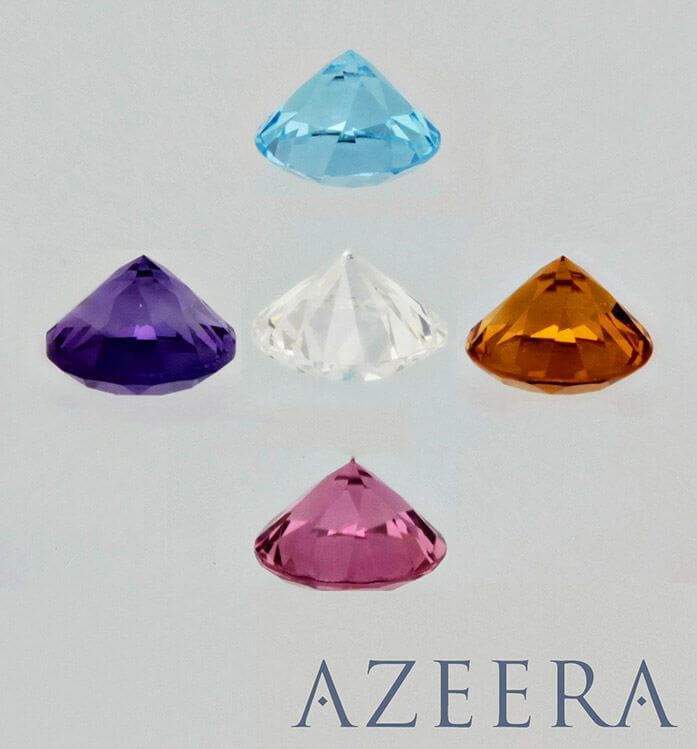 The diamond cut versus the AZEERA Gems. Center stone: Diamond. 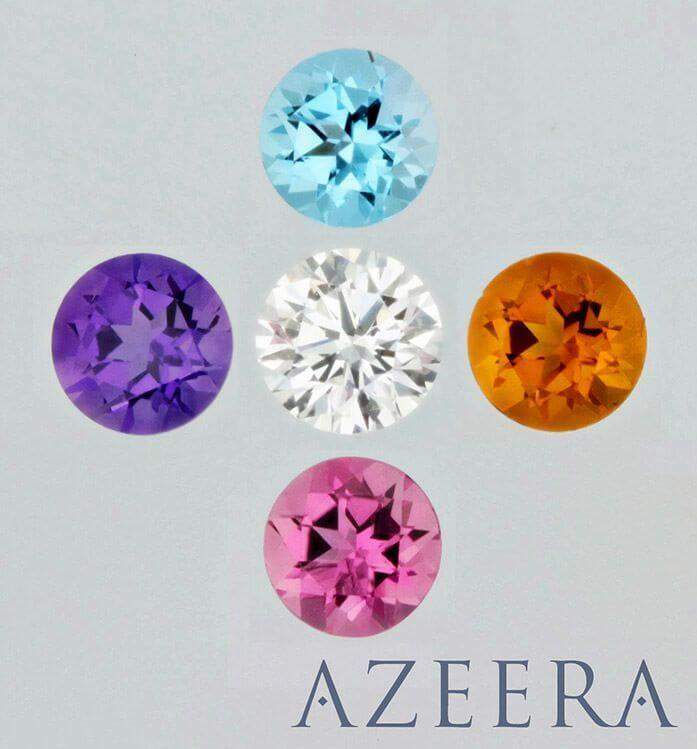 Outer stones starting from the top going clockwise: Swiss Blue Topaz, Citrine, Pink Tourmaline, Amethyst. 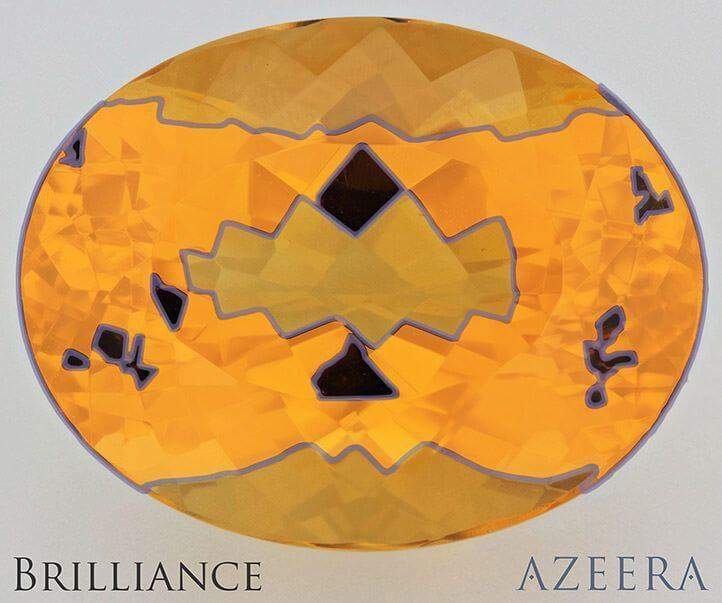 Crafting gems is a delicate art and AZEERA takes the 4 C’s standard seriously. We are passionate about ensuring not only a high quality product, but also educating our customers about industry standards. While we use the 4 C’s standard as a foundation for providing quality diamonds and colored stones, there are some distinct differences between diamond and colored stone classification worth noting. Diamonds are divided into two categories based on color. Standard Range: Grades the absence of color (D-Z, D being colorless and Z being dominant in color). Fancy Color Range: Grades the strength and intensity of the color (Faint, Very Light, Light, Fancy, Fancy Intense, Fancy Dark, Fancy Deep, and Fancy Vivid). Diamonds with a color grade higher than K can also be graded according to the fancy color scale. Colored stones follow the same methodology as fancy colored diamonds, but the range is broken down into three individual components. Hue: The apparent basic color of the gem on first impression. Common and familiar hues are red, orange, yellow, blue, violet, and purple. In many cases, you will notice that a gem is not entirely one color, in which case it can be describe with a secondary modifying color. For example if a strongly red ruby has hints of orange, its hue would be described as orangish red. Tone: The quality of color or the amount of light and dark in a color. Tone ranges from white to black. Saturation: The strength and intensity of the hue. This is the same criteria used in grading fancy colored diamonds. Gems that are washed out or low in saturation are described as brownish or grayish, while strongly saturated gems are deep and vivid. You will also notice in many colored stones, such as peridot and tourmaline, two distinct colors. This elegant characteristic caused by the crystal structure is unique only to color gemstones. When two colors are present, the gem is described by the dominate color appearing throughout the body of the stone. 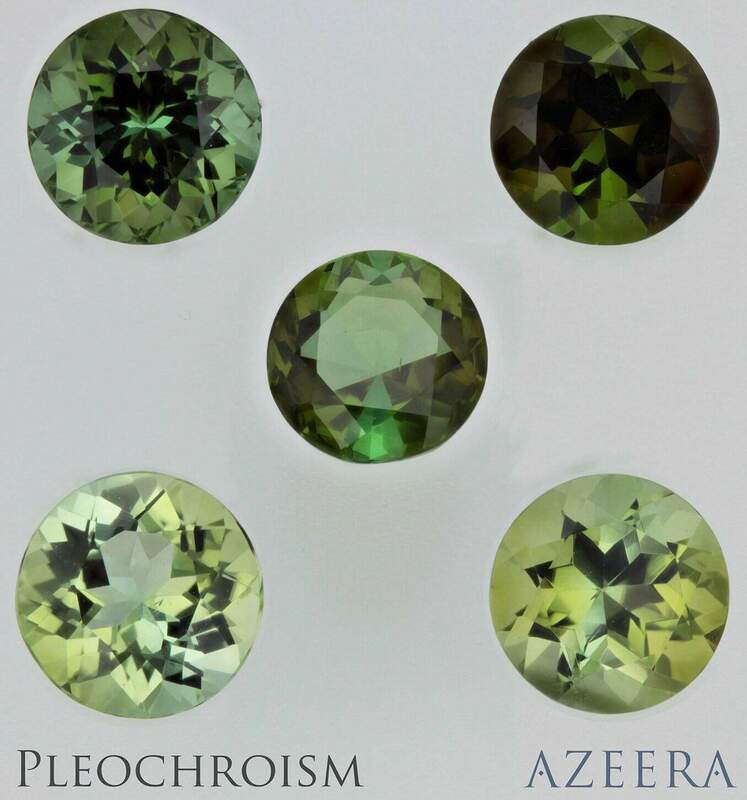 Pleochroism is when doubly refractive gems displace two noticeable body colors. Here we see pleochroism in varying shades of green tourmaline. Cut is the characteristic that grades a stone’s ability to play with and reflect light. Both well-cut diamonds and colored stones require proper proportions, symmetry, and an excellent polish to demonstrate a high-grade cut. Precision cutting allows fine gems to display brilliance (internal and external light reflection as perceived by the naked eye), fire (light separating into spectral colors from internal reflections), and scintillation (flashes of light and color). In diamonds, brilliance, fire, and scintillation are noticeable and easily measured. However, in colored stones, the spectral colors produced from fire and scintillation are masked by the body color of the gem. Thus, for colored stones more emphasis is place on grading overall brilliance. Under the category of brilliance, colored stones prominently display two noticeably different traits from diamonds. Windowing:Light areas around the stone where light escapes without reflecting internally, giving a glassy look. Extinction:Darkened areas around the stone where no light returns to the eye. Unlike diamonds, the brilliance of a colored stone is not optimized by the cut. Instead, a skilled cutter takes into account proportions and symmetry, along with color, inclusions (foreign matter found within the stone), and shape of the rough to maximize brilliance. It takes years of experience for a cutter to be able to bring out the true beauty in a colored stone. Clarity grades the type and location of inclusions found in diamonds and colored stones. To the average person, these inclusions are the least desirable trait in gems, but to gemologists, they are the most important. Through scientific analysis of theses inclusions, clarity reveals the nature of the crystal structure, chemical composition of the gem and its impurities, and the environment in which the gem forms. Because each gem’s origin is unique, the clarity scale for each gem also varies. Diamonds, composed primarily of carbon under extreme heat and pressure, have six clarity grades in which they can be assigned: Flawless, Internally Flawless, Very Very Slightly Included, Very Slightly Included, Slightly Included, and Included. The simple anatomy of a diamond allows it to form in a broad range of clarities. Type I: No visible inclusions found with the naked eye; considered “eye-clean”. Type II: A few noticeable inclusions found with the naked eye; considered not “eye-clean”. Type III: Many noticeable inclusions found with the naked eye; considered not “eye-clean”. *Clarity types only apply to transparent or see-through stones. Black Onyx does not have a clarity type since is it is commonly found semi-translucent to opaque (not transparent). In the case of calibrated sizes (stones standardized in dimensions), carat weight can determine the estimated dimensions of a stone and vice versa. Tiny, round diamonds under 1 carat are often referred to by their weight rather than their dimensions. On the other hand, calibrated colored stones are referred to by dimensions but also have defined approximate carat weights. The approximate carat weight of a colored stone will determine how the stone is set. A gem with more weight may be too deep to set in a shallow mounting. A gem with less weight may have a shallow pavilion (underside) which may create more windowing within the gem. Gems can be cut to have the same face-up dimensions, but can have varying depths. These two pink tourmalines are approximately 11 mm by 8 mm and look very similar face-up. When they are place face-down, their true size is revealed. The tourmaline on the left is 4.71 ct. and the tourmaline on the right is 2.89 ct. Matched gems will have similar cuts, colors, and clarities. 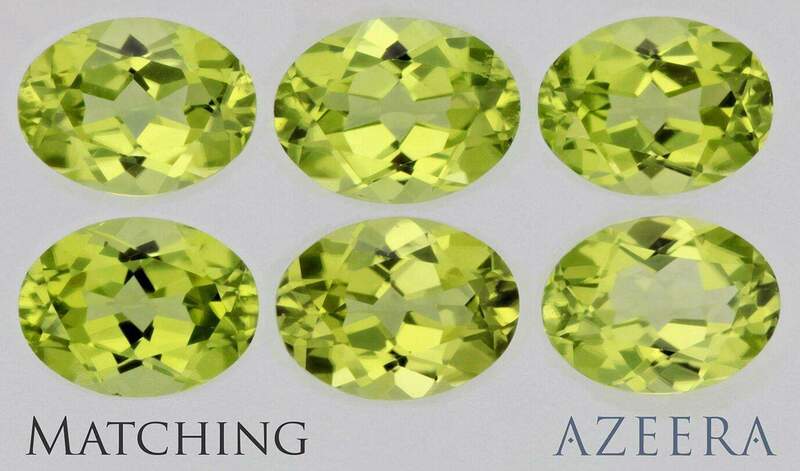 The upper row of peridot shows a well matched set of stones while the bottom row shows a poorly set of matched peridot.